Careful preparation for a masterwork Degas' real intention revealed "Degas just gets better and better" A small but revealing exhibition at the Morgan focuses on one classic work by Degas, Miss Lala at the Cirque Fernando, and surrounds this show centerpiece with numerous examples of the drawing - the draughtmanship - for which Degas is more renowned among the cognoscenti than even his extraordinarily popular paintings. The sketches and the pastels with which he prepared to execute the finished masterpiece throw much light on what Degas' objectives were in creating the final work, which has long been the subject of study by curator Linda Wolk-Simon, the head of drawings and prints, who is responsible for mounting the tribute. =========================================================== MORGAN PRESS RELEASE: NEW EXHIBITION AT THE MORGAN LIBRARY & MUSEUM EXAMINES THE STORY BEHIND EDGAR DEGAS’S GREAT PAINTING, MISS LA LA AT THE CIRQUE FERNANDO THE WORK—ON LOAN FROM THE NATIONAL GALLERY, LONDON—IS ACCOMPANIED BY REVEALING PREPARATORY DRAWINGS AND SKETCHES, AS WELL AS BOOKS, PRINTS, AND PHOTOGRAPHS THAT SHED DRAMATIC NEW LIGHT ON DEGAS’S CREATIVE PROCESS Degas, Miss La La, and the Cirque Fernando February 15–May 12, 2013 **Press Preview: Thursday, February 14, 2013, 10–11:30 a.m.** RSVP: (212) 590-0393, media@themorgan.org New York, NY, January 8, 2013—For several successive evenings in January 1879 Edgar Degas (1834–1917) attended performances by a famous aerialist known as Miss La La at Paris’s Cirque Fernando. Riveted by what he saw, Degas would immortalize her breathtaking act—she was hoisted to the circus’s seventy-foot ceiling by a rope clenched between her teeth—in his painting, Miss La La at the Cirque Fernando. The work was first shown at the Fourth Impressionist Exhibition in Paris in 1879, and was immediately championed for its unusual subject matter and boldness of composition. Beginning February 15, the story behind this remarkable work will be told in depth for the first Edgar Degas (1834–1917) Miss La La at the Cirque Fernando, 1879 Oil on canvas, 117.2 x 77.5 cm. Bought, 1925 (NG4121) National Gallery, London, Great Britain © National Gallery, London / Art Resource, NY 1time when The Morgan Library & Museum presents Degas, Miss La La, and the Cirque Fernando. The exhibition brings together Degas’s painting, on loan from the National Gallery in London, and a rich array of related material, including preparatory drawing pastels, an oil sketch, and a print by the artist. Also on view will be three works by other painters of the period depicting scenes at the Cirque Fernando, as well as books, lithographs, photographs, prints, and circus programs that provide a more complete picture of Miss La La and her troupe. s, “Miss La La at the Cirque Fernando remains as arresting today as it was when the artist created it over a hundred years ago,” said William M. Griswold, director of The Morgan Library & Museum. “The subject is unique among Degas’s paintings. This exhibition tells the story of the genesis of the work and its captivating theme with a fascinating display of drawings and prints, as well as literary, historical, and photographic material of the period.” Edgar Degas (1834–1917) Miss Lala at the Cirque Fernando, 1879 Pastel on paper, 24 x 18 3/4 in. N04710 Presented by Samuel Courtauld 1933 Tate, London / Art Resource, NY MISS LA LA AT THE CIRQUE FERNANDO From his earliest studies, Degas appears to have intended to record Miss La La’s astonishing feat, rather than her physical likeness. The preparatory drawings and pastels in the exhibition reveal his steadfast avoidance of Miss La La’s facial features, and his choice to focus instead on her muscular limbs, shimmering costume, tuft of black hair, and timeless, frozen pose of suspension. Only in his earliest depiction of the aerialist, dating to January 19, 1879, did the artist show the performer frontally rather than in profile, as she appears in the related painting and the other preliminary studies, all of which are in the 2 Edgar Degas (1834–1917) Miss La La at the Cirque Fernando, 1879 Black chalk with touches of pastel, 18 ½ x 12 5/8 in. 36.7 The Trustees of the Barber Institute of Fine Arts, University of Birmingham exhibition. In each, Miss La La appears in virtually the same pose as in the National Gallery painting, suggesting that Degas arrived at this idea early in the genesis of the composition and never veered from it. exhibition. In each, Miss La La appears in virtually the same pose as in the National Gallery painting, suggesting that Degas arrived at this idea early in the genesis of the composition and never veered from it. The painting itself was followed by a drawing done from memory of Miss La La and her dental apparatus. Although Degas executed two obscure monotypes of circus subjects (one of which, a scene at the Cirque Fernando, is included in the exhibition), the National Gallery picture is his only circus-themed painting. Few biographical details are known about Olga, the aerialist known variously as Miss La La, La Femme Canon, L’affût vivant, La Mulàtresse-Canon, the Venus of the Tropics, and the Black Venus. Born in Prussia in 1858 to a black father and white mother, she began performing around age ten. She later became the star attraction of the traveling Troupe Kaira, which also featured renowned trapeze arti Theophila Szterker (1864–1888), known as Kaira la Blanche, and two supporting members whose identities are revealed for the first time exhibition. Unidentified photographer Miss Lala at the Cirque Fernando, circa 1880 Albumen silver print, 15 7/16 x 11 5/16 in. immerli Art Museum at Rutgers Museum Purchase 1999.0187 Collection Zion Z University,University, st e in the e hung Miss La La was renowned for her seemingly superhuman displays of strength but, notably, Degas chose not to record her most sensational feat—a carefully orchestrated, complicated tableau in which she upside down from a trapeze, gripping a canon weighing over one hundred-fifty pounds between her teeth as it was fired with a “tremendous report”—that earned her the epithet, “La Femme Cannon.” Instead, he depicted her iron-jaw suspension act, showing the performer ethereal, weightless, and enveloped in a radiant light, rising to the heights of the circus ceiling in a composition evocative of saints rising in apotheosis. Degas’s drawing of Miss La La alongside the dental apparatus used in her performance—sketched a year or more after the completion of the painting—suggests that the artist was afforded a closer look at the implement during some kind of personal exchange with the entertainer. This may have been on the occasion of her visit to his studio, located close to the Cirque Fernando on rue Fontaine, to which Degas referred in a letter to his friend, the writer Edmond de Goncourt, whose circus-themed novel was published weeks after Degas completed the painting Degas’s drawing of Miss La La alongside the dental apparatus used in her performance—sketched a year or more after the completion of the painting—suggests that the artist was afforded a closer look at the implement during some kind of personal exchange with the entertainer. This may have been on the occasion of her visit to his studio, located close to the Cirque Fernando on rue Fontaine, to which Degas referred in a letter to his friend, the writer Edmond de Goncourt, whose circus-themed novel was published weeks after Degas completed the painting. Edgar Degas (1834–1917) Sketchbook (notebook 29), 19 th century Pencil, charcoal, blue chalk Thaw Collection, The Morgan Library & Museum, New York. 2004.35 THE CIRQUE FERNANDO Miss La La at the Cirque Fernando is as much a depiction of the circus building in which the aerial act took place as it is of the aerialist herself. Degas devoted a series of studies to this aspect of the composition, often including annotations to aid him in producing a more accurate rendering of the space. (One careful drawing of the circus architecture is inscribed “les fermes sont plus penchés,” “the rafters are more inclined”).An American visitor to Paris writing in 1869 remarked that, next to theater and opera, the circus was the most popular form of entertainment in Paris.The Cirque Fernando debuted on October 8, 1873, under the directorship of equestrian Ferdinand Beert, known as Fernando. Its original, temporary structure Edgar Degas (1834–1917) The Cirque Fernando Architectural Study Black and red chalk and pencil on two sheets of j ined pink paper, 18 7/8 x 12 3/8 in. o 38.10 The Trustees of the Barber Institute of Fine Arts, University of Birmingham was replaced by a permanent edifice that opened on the same site on June 25, 1875, where it stood for nearly a century until its demolition in 1972. In 1897 the Cirque Fernando was renamed the Cirque Medrano after the popular clown Geronimo Medrano, known as “Boum-Boum.” The Cirque Fernando attracted all social classes, whose ranks were preserved by the seating arrangements: thirty spacious reserved seats; 420 first class seats; 630 second class seats, 1,000 third class seats, and standing room for an additional 420 onlookers. The main part of the building—a sixteen-sided polygon—was seventy feet high. There is no known photographic record of the interior of the Cirque Fernando, but ample early written accounts and printed images reveal much about its appearance. Its most iconic feature was its red and white ring, represented in Renoir’s Two Little Circus Girls, painted in the same year as Miss La La; in various depictions by Toulouse-Lautrec of the circus’s famed equestrian performances, one of which is on display; and in HenryGabriel Ibels’s images of a clown, almost certainly “BoumBoum,” represented in the exhibition by two lithographs. Henry-Gabriel Ibels (1867–1936 ) At the Cirque (Au Cirque), 1893 Color lithograph, 22 1/8 x 15 7/8 in. 22.82.1-5 Metropolitan Museum of Art, New York, Rogers Fund, 1922 Image copyright @ The Metropolitan Museum of Art Image Source: Art Resource, NY Choosing to omit the ring, spectators, and nearly all other elements of the circus in his painting, Degas instead focused his attention on Miss La La and a portion of the Cirque Fernando’s ribbed and coved ceiling. Miss La La’s outstretched arms and legs masterfully echo the building’s green iron ribs and trusses and slender orange columns, although those elements of the composition evidently caused the painter some vexation. According to the painter Walter Sickert (1860–1942), who saw Miss La La with Degas in his studio, Degas was so daunted by the building’s steeply-viewed architecture that he enlisted a specialist to assist him with this aspect of the composition. Technical evidence appears to corroborate this account, revealing Degas’s repeated, unsatisfactory attempts to render the angled trusses, columns, and other architectural elements he had assiduously studied in his notebook; indeed, it appears that he delineated the roof beams no fewer than three times. Henry-Gabriel Ibels (1867–1936 ) At the Cirque (Au Cirque), 1893 Color lithograph, 22 1/8 x 15 7/8 in. 22.82.1-5 Metropolitan Museum of Art, New York, Rogers Fund, 1922 Image copyright @ The Metropolitan Museum of Art Image Source: Art Resource, NY Of Degas, the novelist Goncourt remarked, “Among all the artists I have met so far, he is the one who has best been able, in representing modern life, to catch the spirit of that life.” The “poetic reality”—realism transformed by artifice—that Goncourt sought to create in writing his circus novel is what Degas, too, was striving for in his circus invention. What initially appears to be a faithful record of a scene from modern urban life is, in reality, a deliberate artistic invention that conceals and obscures more than it reveals. Although he deliberately omitted the more mundane details of the full circus scene, Degas did reveal the mechanical apparatus behind the artifice of the performance—the rope by which Miss La La was held aloft—thus puncturing the illusion of his carefully crafted scene of modernity and, in doing so, acknowledging the irony of the poetic reality he so carefully constructed. CATALOGUE Degas, Miss La La, and the Cirque Fernando is accompanied by a fully illustrated catalogue, written by Linda Wolk-Simon, curator of the exhibition, with additional contributions by Nancy Ireson and Eveline Baseggio Omiccioli. It presents new biographical and historical findings about Miss La La and her troupe, and a revealing discussion about the popularity of the circus as a venue for artists in Paris in the last decades of the nineteenth century. Available at the Morgan Shop and online at www.themorgan.org/shop. RELATED PUBLIC PROGRAMS LECTURE Degas, Miss La La, and the Cirque Fernando Tuesday, February 19, 6:30 pm Linda Wolk-Simon, Charles W. Engelhard Curator and Head of the Department of Drawings and Prints, will discuss the works and main themes in Degas, Miss La La, and the Cirque Fernando.The exhibition will be open at 5:30pm especially for lecture attendees. This program is made possible by the Franklin Jasper Walls Lecture Fund. Free; Advance reservations suggested 212.685.0008, ext. 560, tickets@themorgan.org 6FAMILY PROGRAMS Itsy Bitsy Big Top: Build a Mini Circus Saturday, March 9, 2–4 pm Clowns and acrobats, jugglers and magicians, lions, horses, and elephants! Families will bring them to life in a ring of their own during this workshop led by educator Lisa Libiki. After a short visit to the exhibition, families will build a small circus using a variety of materials such as wire, fabric, and paper. Appropriate for ages 6-12. This workshop is limited to families with children. There is a limit of two adult tickets per family. $6; $4 for Members; $2 for Children 212.685.0008, ext. 560, themorgan.org/programs Spring Family Fair: Join the Circus! Sunday, April 28, 2–5 pm This year’s annual Spring Family Fair will celebrate the Big Top! The Ben Jam troupe returns to flip the traditional French circus on its head, as the animals tame the tamers. Conductor, composer, and Juilliard Pre-College faculty member Adam Glaser will transport families to the middle of a three-ring circus during The Composer’s Paintbrush: Carnivals and Festivals, the third installment of his acclaimed multimedia musical series. Circus-related crafts, costumes, and clowning workshops will complete this afternoon of family fun! Appropriate for ages 3-12. $8; $6 for Members; $2 for children 212.685.0008, ext. 560, themorgan.org/programs Family programs are generously underwritten by Great Circle Foundation Inc. TOURS Stroller Tour Wednesday, March 6, 10:30 am New parents, family caregivers, and their children are invited to revel in the spectacle of Le Cirque Fernando! They’ll travel back to 1879, when Parisians, including Edgar Degas, were mesmerized by aerialist Miss La La, one of the most famous circus performers of her time. This one-hour tour will explore Degas’s fascination with Miss La La and her circus. Free with admission Between the Lines Saturday, April 6, 11 am Written or drawn, lines are meant to be read and interpreted. In this new series of interactive gallery conversations, a museum educator will lead participants in a forty-minute discussion inspired by a selection of works from a current exhibition. April’s tour will take its cue from Degas, Miss La La, and the Cirque Fernando. Free with admission; Space is limited on a first-come, first-served basis. 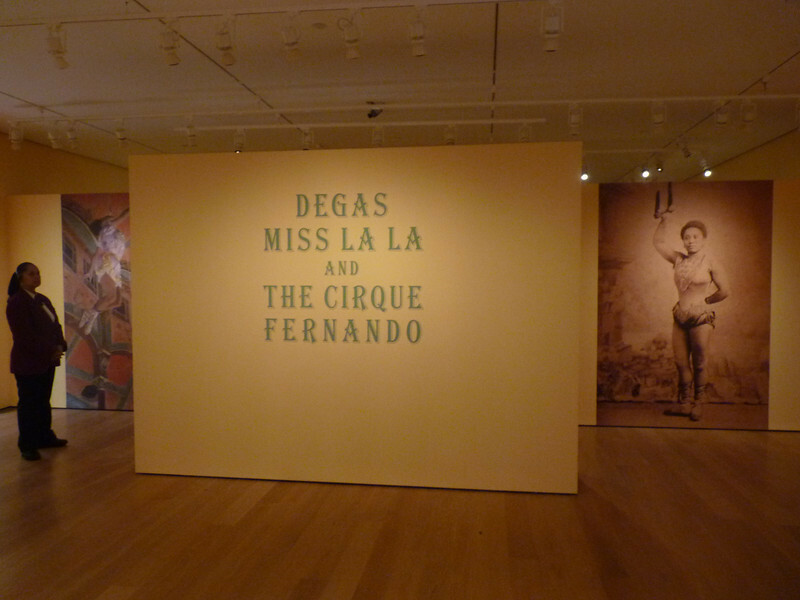 7ORGANIZATION AND SPONSORSHIP Degas, Miss La La, and the Cirque Fernando is organized by Linda Wolk-Simon, Charles W. Engelhard Curator and Head of the Department of Drawings and Prints. Lead funding for this exhibition is provided by Karen H. Bechtel and by a grant from The Florence Gould Foundation. Further generous support is provided by the Alex Gordon Fund for Exhibitions and the Franklin Jasper Walls Lecture Fund. The programs of The Morgan Library & Museum are made possible with public funds from the New York City Department of Cultural Affairs in partnership with the City Council, and by the New York State Council on the Arts with the support of Governor Andrew Cuomo and the New York State Legislature. The Morgan Library & Museum The Morgan Library & Museum began as the private library of financier Pierpont Morgan, one of the preeminent collectors and cultural benefactors in the United States. Today, more than a century after its founding in 1906, the Morgan serves as a museum, independent research library, musical venue, architectural landmark, and historic site. In October 2010, the Morgan completed the first-ever restoration of its original McKim building, Pierpont Morgan’s private library, and the core of the institution. In tandem with the 2006 expansion project by architect Renzo Piano, the Morgan now provides visitors unprecedented access to its world-renowned collections of drawings, literary and historical manuscripts, musical scores, medieval and Renaissance manuscripts, printed books, and ancient Near Eastern seals and tablets. General Information The Morgan Library & Museum 225 Madison Avenue, at 36th Street, New York, NY 10016-3405 212.685.0008 www.themorgan.org Just a short walk from Grand Central and Penn Station Hours Tuesday–Thursday, 10:30 a.m. to 5 p.m.; extended Friday hours, 10:30 a.m. to 9 p.m.; Saturday, 10 a.m. to 6 p.m.; Sunday, 11 a.m. to 6 p.m.; closed Mondays, Thanksgiving Day, Christmas Day, and New Year’s Day. The Morgan closes at 4 p.m. on Christmas Eve and New Year’s Eve. Admission $15 for adults; $10 for students, seniors (65 and over), and children (under 16); free to Members and children 12 and under accompanied by an adult. Admission is free on Fridays from 7 to 9 p.m. Admission is not required to visit the Morgan Shop.